Just a random little post today, but maybe one we all can relate to. Yesterday was one of those days where Ian and I just weren't really clicking. It's like we were on two separate planets. With different languages. Different body languages. Different everything. Real meanings were getting lost in translation through texts. Text messages can great, but they can also be the devil. Know what I mean? Then, we got to a good point and he asked if he could grab a few happy hour beers out with a friend. Sure, no prob. And I thoroughly enjoyed a few hours at home after work to do my solo thing -- trashy Bravo shows, Pinterest scrolling, you know -- the usual. The thing about being pregnant and sober when everyone else around you has had drinks, though, is that it can make you into a crazy woman. Like, all of the sudden you are the Alcohol Police. So when he came back home, I was just not having an ounce of his silliness, and BAM, back on two planets again. In his defense, he did draw a bath for me which was nice. And that helped me cool my jets before bedtime. I've never personally liked the advice "Never go to bed angry." I just don't think that it's necessary to feel the pressure of having to end a fight before letting yourself fall asleep. By the time we went to bed we were cool, but we weren't 100% "us". So, my amended version of that advice is this: "Never get out of bed angry." That's what works for us. Maybe you fall asleep feeling totally peeved, but if you can snake your little foot under the sheets in the morning and connect with that person again, murmur out some "I'm sorry / No, I'm sorry" apologies, and cuddle for a bit before getting up, that's the good stuff. So we did that this morning and then we had the most hilarious chat over coffee. 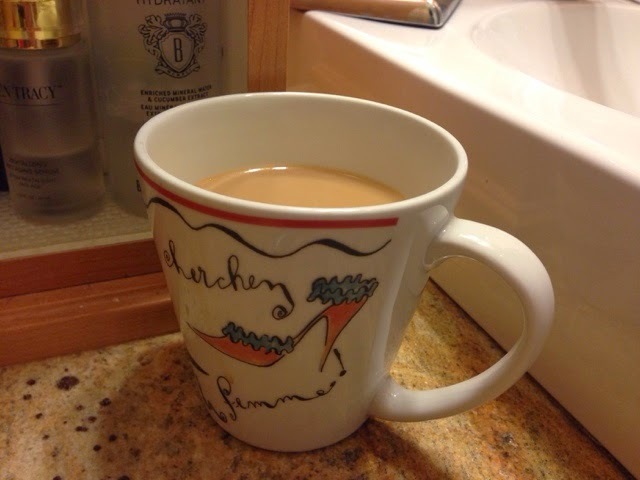 I saw the clock ticking, and I knew I was going to be having to rush to get ready for work, but just standing in the kitchen holding our mugs and laughing was suddenly the most crucially important task ever. What were we laughing about? We decided that since Ian is self-employed and represents several companies, I am going to start just filling out random employer names and job titles on all of the pregnancy-related paperwork I have. We decided that he is going to be a Ringling Brothers Trapeze Artist, a Magician, and an Adult Film Star. It actually sounds like a great way to end the "not us" feelings. Something must be in the water because you are the fourth person (including myself) that's been off with her husband this week! I love this. "Never go to bed angry" is an absolute crock, in my opinion - sleep restores and rejuvenates and gives you the gift of distance from whatever it was that got you so heated to begin with. I really like "never leave bed angry". Even non-angry mornings start with some footsie and some snugs, but it's even better when they're after a night on opposite sides of the mattress. We've all had those days. Yes, being prego does sometimes make you the alcohol police. Just think... A FEW MORE WEEKS until you can booze it up! Blogger, Anni, who is due in a few weeks told me she's already making a list of what beers to pack in her hospital bag! LOL!!!!!!!!!!!! Ain't that the truth!! I don;t always see eye to eye with my hubs. And goodness when I am sober and he is not - yeah I am usually not having any of that either. But we always find our way back and that's what matters! Pretty soon you will be drinking champagne celebrating that little baby! Never going to bed angry really is about impossible. But settling the issue before getting out of bed is much more doable! Love this. Love this! Sometimes I find that the time R and I are spending together during the week isn't quality time-- i.e. just sitting next to each other on the couch, on our phones or watching TV. Sometimes when that happens we will go out some place and grab a beer and chat where there is no TV or phones or distraction and BOOM! We connect instantly. Amen sista! Those touchy feet in the morning and cuddles...totally know what you're talking about! Totally agree about texting! And also about when I'm sober and he's had something to drink, I don't find anything amusing! Glad to know I'm not the only one! I like both methods - We never go to bed angry at our house and also if we settled our disagreement before bed we always test the water in the morning just to be sure it really is settled. But I must say I am on team "never go to bed angry" and it works for us. All that matters is that everyone works it out their way! Love the silly talk in the morning though! I love that this post was so candid - you're right! Marriage is not always a walk in the park, and there will inevitably be days when you and your husband are just not on the same page. I agree with you about the "never go to bed angry" advice - my husband and I do the same thing that you discussed doing the following morning! Sometimes a good nights sleep just puts it all in perspective. This is great April! Sometimes when we get in our petty little arguments we will both get in bed and pout/not speak but in the morning its like nothing even happened and we are saying I love you and are over it. My favorite time is when we get home from work and snack in the kitchen talking about our days! Totally agree about the never going to bed angry thing. Most of the time, you're still heated, and it leaves more room to fight. You end up 10x worse than when you started. Most of the time, one of us will text the other first thing in the morning that we're sorry. Or wake up the other person and say it before leaving for work. I can remember getting so annoyed with my husband when I was pregnant and he would come home after a happy hour trip...rambling on and on about nonsense. I think that's totally normal though! I love that you keep it real. Seriously. I totally agree! I'm pregnant and for some reason, it drives me crazy when my husband is the least bit tipsy. I don't know why it bothers me so much haha?!? Thank you for sharing your honesty in this post! I can relate to so much of what you said and like the idea of not getting out of bed angry. When we argue about something petty, sometimes I can't think of going to sleep until it is resolved, but then as someone else said, it leaves more room for getting back into it and then you're tired and running in circles. Everything is fresher in the morning and making each other laugh is absolutely huge! Loved this post! One of the best posts I've read :) love this! Thanks for keepin it real! I can totally relate to this. After reading the other comments, it seems many can relate to this and that's good. I agree with the don't get out of bed angry thing. We so do that. I swear sometimes I really do think my husband and I speak different languages! I have been saying all week that we don't seem to be connecting. I agree with the quality time part too. My favorite times together are no tv and no phones just great conversation. We don't even have to go out just hanging out together in our backyard talking is wonderful. Thank you again for this wonderful and honest post about real life stuff. Unrelated- have you taken hot baths throughout pregnancy? Or "warm"? I have been dying for a bath but I'm so terrified I will make the water too hot! Thank you for being so honest!! So often people want to present marriage with rose colored glasses but in all honesty, it is work! It is totally worth the effort but things will not be perfect every day. If you can be this honest with the blogging world, then your little babe will be set up for relationship success by watching their parents and observing their marriage. I was the crazy alcohol police when I was pregnant- I was constantly grilling my husband after he'd been at happy hour or dinner like how many beers did you have? Are you sure you should have driven? Even though I know he would never do anything stupid! Sometimes you just have weeks and months where you're on different pages and the new baby is going to bring a whole different element into the mix but it sounds like you all have a good thing figured out! I don't always agree with the 'never go to bed angry' saying either. Sometimes you are just too heated to think clearly in that moment. And in the morning it's a brand new day and it's much easier to laugh at things. Oh gosh, I can't handle being sober sally when my husband is not. Angry girl right here...although I know I've been that tipsy girl plenty of times to him. :) Whoops. We are having a lot more of those "off" days now with two under two. When everything becomes all about the kiddos it can be so easy to disconnect. We always know when it's time to take a step back and reconnect when we start bickering like the bickersons. Loved this post! Keeping it real. I truly love this post. Sometimes I get caught up on the "don't go to bed angry" sentiment and instead we end up frustrated with each other because we're beating a dead horse. I think the "don't get out of bed angry" idea is much more appropriate. Sometimes you just need to sleep on something to realize how silly it all was in the first place...or at least to give you some perspective and distance from the high-charged emotions of the situation. You are so cute. So, I'm more in the Grandmother mode, you're tired and you husband is nervous. Baby coming soon and you're aware of something in diapers will be here before to long. Marriage is the hardest job you'll ever have and the most rewarding. It takes work,determination and humor. Just remember to laugh. You have a beautiful family and so much to be happy about. From a wife of 42 yrs. mother of two and grandmother of 5 beautiful grandchildren. Remember to always stay young of heart. We have all been there and Bryce and I threw out the "never go to bed angry" rule a while ago! We're both stubborn and don't always like to give in, we've found though that if we just go to bed (albeit angry), we've usually cool down during the night, end up cuddling, and have moved on by morning!